Grand Funk Railroad (also known as Grand Funk) is an American rock band that was highly popular during the 1970s. 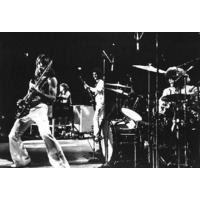 Grand Funk Railroad toured constantly, packed arenas worldwide, and received four RIAA gold albums during 1970—the most for any American group that year. The current Grand Funk Railroad lineup uses the nickname "The American Band," a reference to its 1973 hit "We're an American Band." A popular take on the band during its heyday was that, although the critics hated them, audiences loved them. The band's name is a play on words of the Grand Trunk Railroad, a railroad line that ran through the band's home town of Flint, Michigan.